Moms (especially the new ones!) have the hardest job on the planet, and that’s no exaggeration. 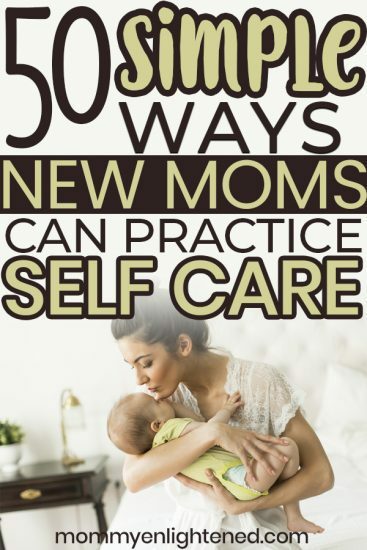 We don’t often consider how critical it is to pass along self care tips for new moms, but they need it more than most. As a new mom, you’ve created a human life in your very own body. You’ve carried it around for 9 months and then brought it screaming into this world. No one can fault you for feeling overwhelmed, stressed, exhausted, and completely empty. But, to be the kind of mom you want to be, you have to be good to yourself. As they say, you can’t pour from an empty vessel. I remember when I had my first baby. Although my husband was incredibly supportive of me, I still felt super alone. I didn’t know how to survive the first few weeks with a newborn, and I certainly didn’t know how to ask for help. I knew better the second time around. I knew that there were little things I could do (almost) every day to help make dealing with a newborn (and all their strange habits) manageable–even enjoyable. You should view being good to yourself as your job. Truly. If you ignore your own needs, you do so at your own peril. You’ll get sick, you’ll be more emotional than you want to be, and worst of all, you won’t be able to enjoy your little one in the way you want to. 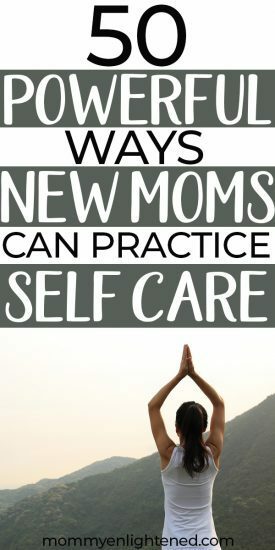 Let’s look at some simple self care tips for new moms. There are affiliate links in this article. You can read about this in my disclaimer. From charcoal to avocado, a face mask is a delightfully calming way to spend a few minutes. It’s inexpensive, quick, and easy and it’ll make you feel good. This set of four face masks are SUPER awesome, and give you options. It’s important that you learn to ask for help. The people in your life who care for you want to do something to help. Don’t be mean to yourself, and don’t cheat friends and relatives of the opportunity to spend time with your kiddo. Distraction can be a powerful tool. When your day has been exhausting and stressful, starting a series will both distract you and give you something to look forward to. We are kind of addicted to different subscriptions, and we have found shows we love with both Netflix and Amazon. Honestly, consider grabbing a thirty day free trial to Amazon video so you have thirty days to binge watch something! Never underestimate the healing power of your olfactory system. Certain smells are very calming. Find a lotion that makes you feel happy and use it every day. This is my VERY favorite lotion. It smells like everything good in the world. Look for a bar that’s 70 to 85% cocoa. It’s loaded with potassium, phosphorus, zinc, selenium and more. Eat it slowly, savoring every bite. Not Facebook. Not Twitter. An actual book. Consider getting a Kindle subscription and see how you like it. I know that plenty of people are on team “real” paper book, but I don’t see the issue with digital personally. If I am being COMPLETELY honest, I don’t know the last time I picked up an actual book. I am a big fan of Audiobooks. You can get a couple of free audiobooks here. The positive power of being still and mindful has been proven again and again. Download a mindfulness app, or pick up a book to learn some easy ways to start being more mindful today. Meditating is one of the best self care tips for new moms that I received from family. Unless you find grocery shopping relaxing, order online. You’ll save so much time and aggravation. It’s a saving grace for lots of new moms. Amazon has a neat program called Amazon Fresh. Grocery delivery straight to your door. Don’t tell yourself it’s only for kids. Adults across the world play with it. It stops the fidgeting that happens when you feel stressed or tired. You should try some here. The colors, shapes, and smells will lift you up. Don’t wait for someone to buy flowers for you. I recommend going with something that will continue to grow. I hate buying fresh flowers that wilt and die. Orchids (which you CAN buy online) are MY very favorite, and they can be long-lasting if you take care of them. If you haven’t tried this, I would strongly encourage you to give it some consideration. It’s a tank that holds warm salt water that is the same temperature as your skin. You lie down in the water and slowly all light and all sound disappear. You are completely devoid of any stimuli. Because your body and the water are the same temperatures you become one with it. The salt in the water holds your body up so that you can’t go under if you drift off. People all over the world tout these tanks as incredibly healing both mentally and physically. It’s a glorious way to hit the reset button. You can learn more about the process here. Disrupt monotony at any opportunity. If you always have a turkey sandwich for lunch, and always at noon, mix it up. Personally, I LOVE routine–but I also think a little chaos is good for us sometimes too. You don’t need a reason. Never be embarrassed that you need human connection. I think we ALL have someone that has gone through what you are going through–and they’ll understand. A quick nap of 20 – 30 minutes will give you the energy you need to keep going. Be careful though. The Mayo Clinic warns that naps longer than 30 minutes may cause you to be very groggy on waking. A blog of your own doesn’t have to be about making money or changing the world. Think of it as a way to share your Mom life with people who are probably going through some of the same challenges (and joys) that you are. I love this how to start a blog guide. Carly is very real and can help each step of the way. I am not sure that this counts as a self care tip for moms since starting a blog ADDS more stress–but it’s eventually worth it. Yep. Dance around like a crazy person. You can’t feel bad when you’re being silly. You don’t necessarily have to go to the gym. Turn on some music and work out in your living room. Those perfect moms online who have perfect children and perfect spouses? They don’t really exist. The photos are staged and edited, and photo filters make everything look better than it is. You can’t be like them because even THEY can’t be like them. Get a blank notebook and don’t set any goal for yourself. Doodle. Scribble. Enjoy! There are many, but Duolingo is a favorite. The app does a good job of making the learning fun and easy. Driving alone, with or without music, can be a nice reprieve from daily life. Wait until your partner gets home and tell them you need a break. The internet is endless. There’s so much to see and read that you’ll never reach the end. Mashable usually has fresh lists of fun websites. Go on an internet adventure. Spoil yourself. You’ll feel pretty for days. A skilled masseuse can help get rid of all that tension you’re carrying around. It works like magic. Everyone can easily fall blind to the beauty around us. Take your camera (or use your phone) and snap photos of the things you usually miss. The camera lens will turn your attention to the interesting cracks in the sidewalk, or the soft colors of a bird’s feather, or the beautifully chipped paint on an old building. You may even discover a new hobby while looking for a self care tip! Sometimes a mom just needs a hot fudge sundae as big as her head. Go ahead. You’ve earned it. Take yourself on a little date to see a matinee. Eat popcorn and candy, and let the outside world go. Insert all the proven health benefits of red wine here. Go ahead. Have a glass. Ask your Facebook friends if they are a part of any parenting groups. Talking to other moms about being a mom could be very helpful for your mental health. Just make sure you don’t fall into that comparison trap. Or fall victim to debates on vaccines, circumcision, or any of those other debatable topics. It’s not good for anyone. You don’t have to learn trigonometry on Monday and chemistry on Tuesday. Keep it short and simple, enough to make some new wrinkles in your brain. Take a peek at ELI5 (explain it like I’m 5) on Reddit. You’d be surprised all the cool stuff you can learn there. Whether it’s music from your freshman year in high school or a song you’ve only recently heard, it’ll lift your mood. Go to Spotify and make a go-to playlist for yourself. If you don’t like makeup, skip this one. I am not big on makeup personally. I can’t seem to get it on without looking like a strange clown. But if you love lipstick and mascara, you know the power that they can have. You’ll feel like you again. Learn to say no. You’re not a bad person. You’re a smart person. Say no to the things you don’t want to do or don’t have time to do. A new mom has her fill of obligations. No one will question a resounding NO from you. This was a REALLY hard lesson for me, albeit a really important one. A fresh new look can make you feel like a million bucks. Fact. Silence is golden. Take some deep breaths and enjoy. Your hair will feel soft and almost new again. You’ll feel good about caring for yourself. This may seem like a “duh” moment here. Of course, you want to sleep more! But, as a new mom, you’re almost certainly not getting enough. Change up your bedroom to make it more sleep-friendly. Dark curtains. Nice sheets. A little lavender spritz on your pillow. Go to bed early and remember to turn off electronics. That’s the most important aspect of this self care tip for new moms. In through the nose and out through the mouth. It’s powerful. Apparently you could even lose weight while you do it. Don’t ask me how reliable it is, but it doesn’t hurt to try, right? It doesn’t matter whether you know a glue gun from Mod Podge (I am not sure that I do!) Your creation doesn’t have to be pretty. It’s the making of it that will make you feel good. A little mist will bring to mind sweet memories of other times you’ve worn it. It’s a craze you’ve definitely seen online, and for good reason. It’s a creative way to organize your life. It’s a good way to be reminded to do nice things for yourself every day. I started a bullet journal, and although it morphed more into a “journal” than a scheduler, it’s been life-changing. This is the one I like. If you don’t have space for an outdoor garden, buy some indoor plants. Get your hands dirty and tend to something that doesn’t cry or fill dirty diapers. The internet can teach you how to turn your brown thumb green. It’s remarkable how comforting a bath can be. Turn the lights down and light some candles for a little extra relaxation. Also, if you haven’t taken a bath with Epsom Salts (here’s the ones we use) I totally recommend it. It helps rid you of those aches and pains. Moms take a lot of photos, right? Learn to take great photos by watching YouTube videos or by taking a class. Why does Chinese food taste so good when you eat it from those little cartons? Don’t cook dinner. Have someone else cook it for you! We live in a world where we can listen to story after story via podcasts. You can laugh, or cry, or learn, and everything in between. You can turn your brain off when you listen to a great story. That can be heaven for a new mom. I am kind of a podcast addict. I have five or six that I religiously listen to every single week. Buy yourself a coloring book and some colorful markers and you’ll find yourself zoning out for a few minutes. If you are interested, here’s a NSFW option I thought was pretty funny. 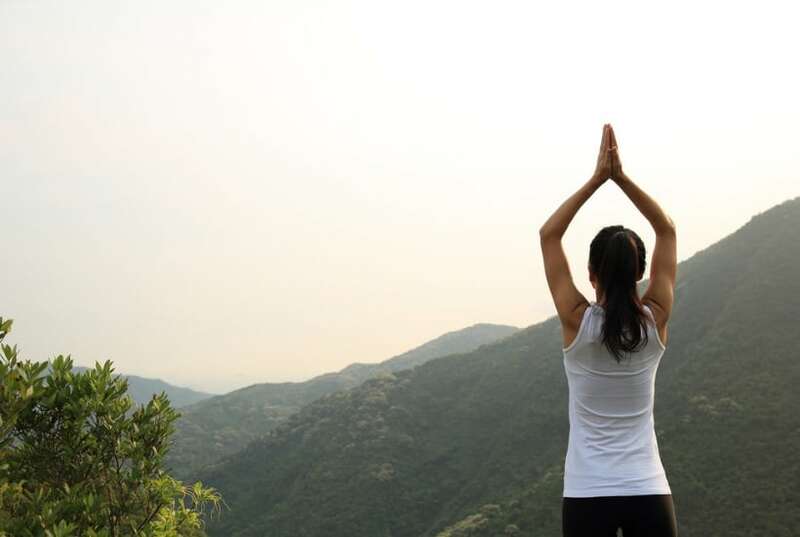 If you’re already proficient at yoga, you’re good to go. If not, you can get free yoga lessons right on YouTube. For Yoga, I SERIOUSLY love Yoga With Adrienne. She’s funny and healing and it’ll help you get back in shape. Don’t be surprised if you become addicted to it. The sillier the better. Find something that makes you laugh right out loud. Laughter really is the best medicine. You’ll feel so much better. Just don’t wake the baby! Goofy is the key word here. Try Bored Shorts or some Japanese game shows. The absurdity is hilarious. You’ll feel ten pounds lighter. I always find cat videos uplifting. But maybe that’s just me. Finally, even if you haven’t found anything on this list that works for you know that you need to find something that’s only for you. It’s the magic sauce every new mom needs. Never forget to be good to yourself. As moms we are so busy taking care of our kids and loved ones that we forget to take care of ourselves. Love that you provided several ideas and tips for practicing self-care. Found this post really helpful, thank you! Thanks for the thoughtful reply. We DO tend to forget to take care of ourselves, even though that’s the most important person to care for (otherwise how can we expect to care for others?) I am glad you found it helpful!